Moderator of appetite is a Nespresso ® compatible active capsule. This 100% arabica FitEspresso capsule contains 100% natural ingredients such as saffron, chili and raspberry. The results of this capsule are clinically proven. 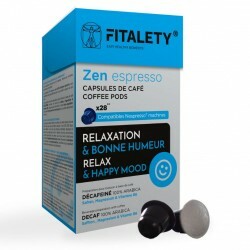 Décaféiné Zen is a Nespresso ® compatible active capsule. This capsule deca 100% arabica contains natural active ingredients such as saffron, magnesium and vitamin B6, which contribute to the good functioning of the nervous system. The results of this capsule are clinically proven.